American kestrels have used nest boxes on our property ever since the first box was placed in a dead hickory overlooking the creek, almost 20 years ago. 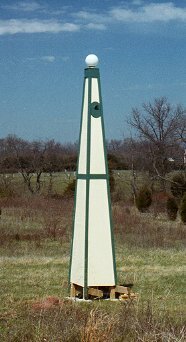 When the hickory was struck by lightning, a new box was placed in a large ash tree 300 ft away, and was immediately used by the kestrels. 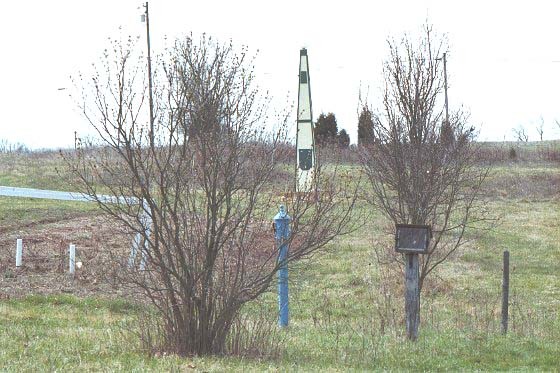 Several years later, I placed a box on a pole behind the wagon shed and blocked the entrance to their old box down by the creek. The kestrels immediately moved to the new box in the yard. Next I decided to mount a nest box on the barn wall with an access door in the rear so the nesting progress could be checked from inside the barn without alerting the adults. Again, the kestrels immediately claimed this wall mounted box and nested there for several years. 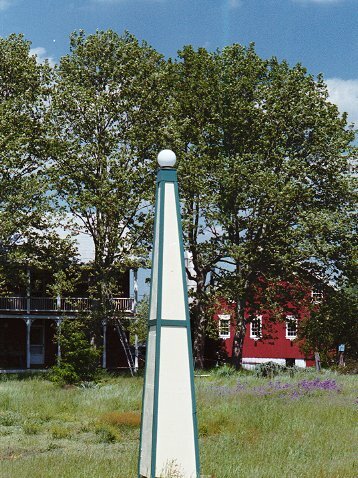 In 2002, this tower was erected in our extended front yard, and, again, the kestrels promptly moved into their new quarters. The tower was designed to allow air flow from ground level up through interior baffles and out the large entrance hole. 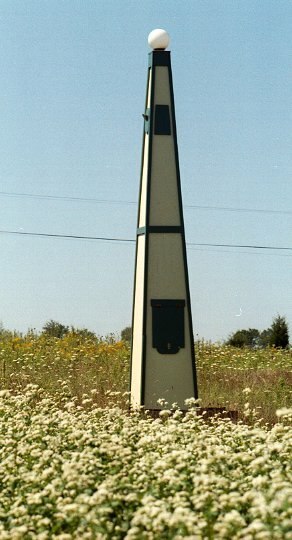 The lower portion of the tower houses an instrument compartment with remote min/max thermometers, vcr and video monitor. A video camera with infrared lighting is permanently installed in the top of the nesting compartment. An electric line is run underground from the house to the tower, since the distance is too great to run video and 12vdc. 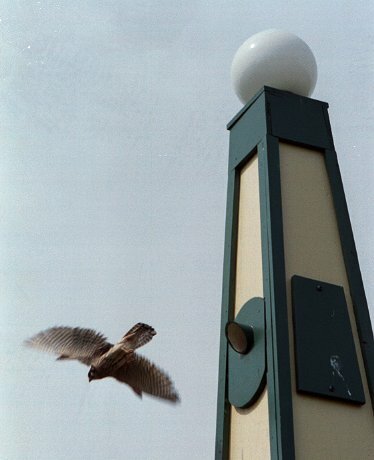 A starling trap with remote release was installed, but was never used. Starlings did move in soon after the tower was erected, but the kestrels discovered the tower the very next day and handled the starling problem themselves. The ventilation design has worked very well, with the temperature in the nesting compartment holding very close to outside air temperature. 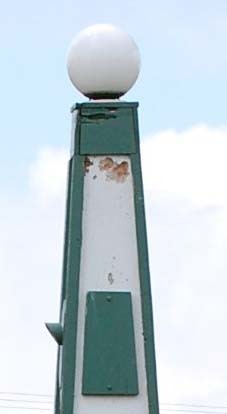 In 2002, 4 kestrels fledged in an uneventful nesting. In 2003, five more successfully fledged and, in August of that year, a single egg was laid, but the box was then abandoned for the year. This was too late for a second brood, but the first time any attempt at a second brood was observed in the 19 years of nest box use. In 2004, nesting began in March, and after the five young fledged, a second brood of five was successfully raised, fledging in July. 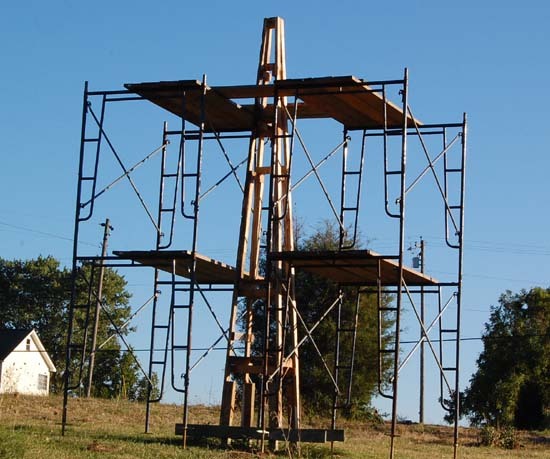 Front view of the tower showing the still unfinished open bottom which allows upward air flow around both the instrument compartment and the nesting chamber. The tower in summer, showing the closest thing we have to lawn. Kestrels like open areas, but have no need for closely mown grass. View from the road.The purpose of the tower is not apparent to passers-by, but I am slowly spreading the word that it is used by "sparrow hawks". 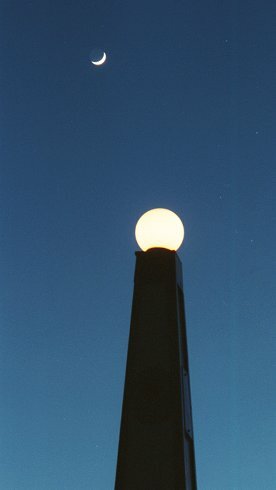 Night view with the 7 watt bulb creating the illusion of a full moon, both in size and brightness when viewed from several hundred feet. Controlled by a timer, the light is only on for 90 minutes each night. A mid-summer cover crop of buckwheat in the front yard garden, at the foot of the tower. Over the years, the plywood had begun to deteriorate, even with repainting. Also, a flicker had excavated a hole near the top of the north wall, directly over the kestrel nest box. Starlings quickly took advantage of this and began nesting on top of the kestrel box, even when the kestrels were also nesting. While a door is provided for access to the kestrel box, I had no access to the starling nest until the siding was removed. At that time, I found over a foot of nesting material and evidence of several nestings. The grass also interfered with the tower ventilation. 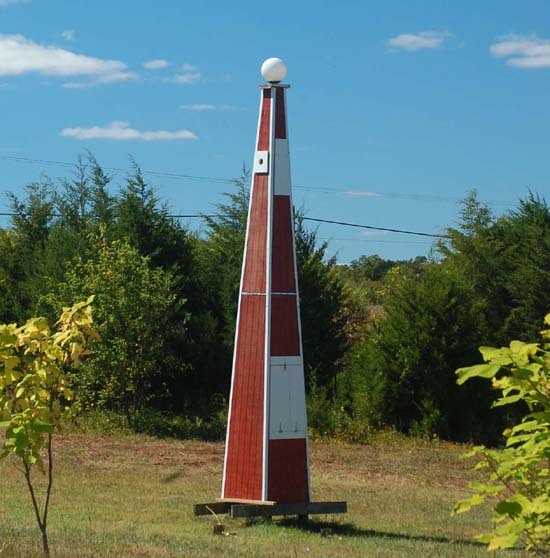 After the 2013 nesting, the tower was partially dismantled and new siding installed. The camera was cleaned and a new remote thermometer was fitted in the nest box. The starling trap was removed, since the kestrels monitored their nest box year round and did a better job than I would do with the manual hole cover and video monitor. As for the chance that a flicker will provide the starlings with a new entrance hole, my fingers are crossed. 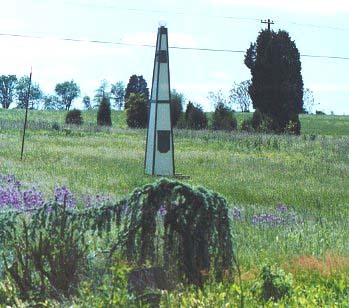 &COPY; 2004 - 2013, American Artifacts and Richard Van Vleck, Taneytown, Maryland.